Angharad Shepherd's Hut07855428791work GlampingCroeso / Welcome to our self catering shepherd's hut called Angharad at Meurig Cottage, located between Lampeter and Aberaeron. Nestled in the picturesque Aeron Valley, adjoining the River Meurig. From here you can explore the local countryside and the surrounding area, with activities and places to visit to suit everyone. Minimum stay 2 nights - £200. 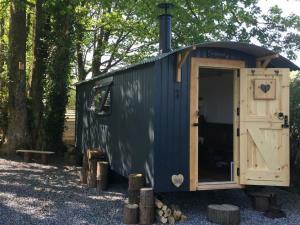 Angharad, which in Welsh translates into "Much Loved / Chosen One" was completed in 2017 and awarded GOLD 5 Star accreditation as a Quality Assured Glamping Site by Visit Wales in July 2018. It has everything you need for a relaxing and romantic break in West Wales. It is warm, comfortable and is located only metres away from the River Meurig. Inside you will find a small log burner, with an intimate dining table for two, a small kitchen area and most important of all, a full sized double bed, with sumptuous pillows and linen. Outside you will find a composting toilet and hot water shower in an adjoining wooden building. Feel free to relax in our bespoke garden pod hidden in the trees, or wander along the river. Weather permitting, light up the chiminea and maybe treat yourself to toasted marshmallows under the stars. Or just sit and talk over a glass of wine. You will have no neighbours nearby as Angharad and all the facilities available are for your exclusive use for the duration of your stay. Wake up to the gentle sound of the river flowing, the woodpecker, the birds singing and the Red Kites soaring high overhead. Angharad provides a quiet and cosy retreat from the hustle and bustle of the modern world. Stoke up the log burner and put the kettle on and maybe start the day with bacon and eggs, freshly cooked outside in our outdoor wooden kitchen. Please also feel free to help yourself to fresh strawberries, mint (for the Pimms) and herbs out of the garden, when in season. We hope you will find everything you need to make your stay in Angharad as comfortable as possible. Traditional board games, dominoes and playing cards are also provided. There is limited internet coverage here, so start your digital detox the Meurig way. Croeso / Welcome to our self catering shepherd's hut called Angharad at Meurig Cottage, located between Lampeter and Aberaeron. Nestled in the picturesque Aeron Valley, adjoining the River Meurig. From here you can explore the local countryside and the surrounding area, with activities and places to visit to suit everyone. Meurig Cottage is in the village of Abermeurig, postcode SA48 8PP. Please note that if you are using a Sat Nav your arrival destination will be the chapel in Abermeurig, not Meurig Cottage, so please use the following additional directions. With the chapel on your right hand side, drive past the chapel and after 20 yards, turn left down a steep lane, signposted Talsarn. The lane bends to the right and after 300 yards, the lane splits into a "Y" junction. Take the right hand turning. Continue along the narrow track for about 200 yards. Meurig Cottage is then on the right, just over the small river bridge. Angharad is on the left in the garden opposite the cottage.